A 2010 report highlights that 24 million individuals in North America alone live in a food desert, locations in which access to affordable, healthy food options are limited or nonexistent. Furthermore, many of these individuals were found to be of lower socioeconomic status. The McQuesten neighbourhood in Hamilton, Ontario has been perceived by its community members to be a food desert, with the closest grocery store being over a 20-minute walk away. The McQuesten Urban Farm was created with the purpose of building the capacity of the community, increasing food security, and reinforcing that everyone has a right to nutritious food. However, there is lower than anticipated engagement among community members. This project’s research will focus specifically on those that live within CityHousing Hamilton (CHH) and nearby Melvin Avenue apartment buildings. Muhammed, Kathleen, Jethro and Ikra from the McMaster's program in Sustainability hosted conversations with local researchers and experts on food security and community engagement, conducted surveys in the McQueensten neighbourhood in three CityHousing Hamilton including one high rise apartment community: 4 days, 281 doors, 76 resident interviews. They used this data to create hypothesis and implementation engagement strategies as well as a customer management tool and volunteer tracking management tool to improve data gathering. They then created and distributed improved marketing materials and research results to the local community. 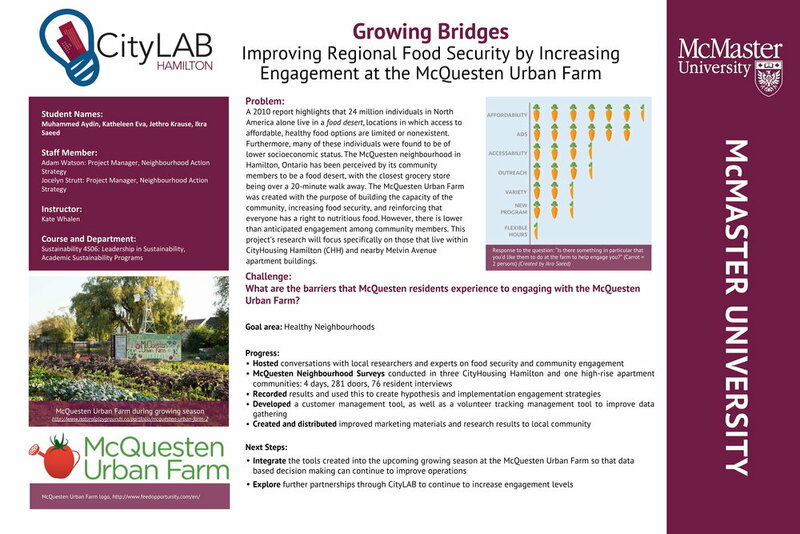 Next the students will integrate the tools created into the upcoming growing season at the McQuesten Urban Farm, so that data based decision making can continue to improve operations while exploring further partnerships through CityLAB to continue to increase engagement levels.